My name is Peter-Paul and I'm Dutch. For almost 10 years I love to see te series again, again, and agian..... I read the book "Its Bouquet-not Bucket" and get interested in the technical sources they have used to make the show. Now I'm curious about more facts like how they build the severel sets in the studio en how they recorded the serie in the studio, I know it's recorded in a studio with live studio audience. Is there anyone who has pictures of the studio set or the floorplans they have used? How did they build the several sets? I like to change information. Welcome on board (of QE 2 of course). You are most welcome at Bouquet's. Just take your shoes off, dear! Welcome to the forum peter-paul, its lovely to have you join us all the way from Holland!! We do have chats on here from time to time with Harold Snoad so you may get the chance to ask him some questions! In the mean time have a good look around the forum as there's loads of information on here! Welcome inside the Bucket residence Peter-Paul! Welcome Peter-Paul. 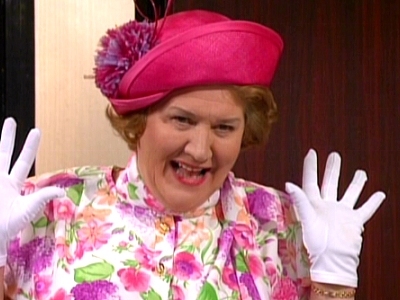 Hope you have a great time here, we're a real friendly bunch on the one website and forum you need for all your Keeping Up Appearances related findings. Glad to have you with us. You bring up some interesting technical questions that I hope will be answered for you. "Please Remember Not To Grunt When Cleaning My Plates"
"Please Dont Brush Against My Walls, I Hate It When People Brush Against My Walls"
HI! I have really hunted for set pics, and have not had any luck. I did find a miniature set, but they are not totally accurate; they are on Flicker. I cringe at no ladys dresser and a door leading, I guess, to the garage, in Hyacinth's bedroom! Keep on checking, and keep filling us in. I am interested also. The pics I can find are not allowed to be copied (I would pay to get them) and say "Sheridan would be appaled" when one tries to copy them. Oh- On You Tube the have "outtakes" of the show, which means you get to see the characters in their mistakes, and get a idea of their real personality!